The U.S. Postal Service dipped backed into the red in the second quarter of fiscal 2016 after turning a profit for the first time in five years during the first three months of the fiscal year. The agency posted a net loss of $2 billion in the most recent period. 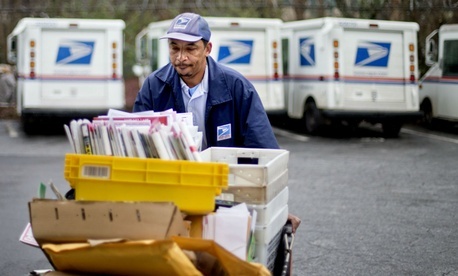 The deficit came despite USPS boosting revenue nearly 5 percent to $17.7 billion from Jan. 1 to March 31. USPS, as it typically has in recent years, turned an operational profit of $576 million when accounting for its controllable costs. While net losses jumped nearly 40 percent in the quarter over the same period last year, the controllable profit spiked 84 percent. The revenue increase was driven largely by an 11 percent boost to package volume, but was also boosted by a now-expired temporary pricing surge. USPS regulators forced the agency to decrease the price of stamps and other market-dominant products in April, which officials said Tuesday would cost $1 billion this fiscal year and $2 billion in subsequent years. USPS is now facing “headwinds” in its mailing business, Postmaster General Megan Brennan said, adding the agency “cannot afford” the lost revenue. She called for a legislative fix to the pricing issue as part of a larger reform package from Congress, expressing optimism for the prospects of such a law due to a scheduled Wednesday hearing on postal issues in the House Oversight and Government Reform Committee. The losses the Postal Service sustained in the quarter were driven primarily by a congressional mandate to prefund future retirees’ health care. An adjustment to the interest rates on USPS’ workers’ compensation liabilities increased costs by $500 million. Despite the net losses, the Postal Service displayed some potentially positive numbers in the quarter. The agency saw first class mail volumes, which have dropped precipitously for the better part of the last decade, were virtually even in the quarter compared to the previous year. To keep up with high demand for shipping and packages, labor costs -- which have mostly decreased due to a shrinking workforce -- actually increased by $362 million, and employees worked 9 million more hours. Joe Corbett, USPS’ chief financial officer, said the increases reflected a growing business need, but fell short of promising that they were emblematic of a turning point in postal workforce trends. “We will continue to be as efficient as possible,” Corbett said on Tuesday.